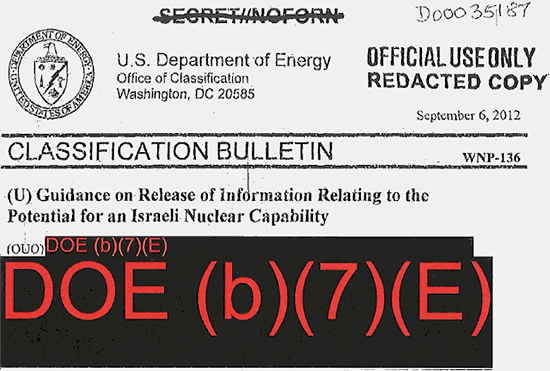 IRmep filed a lawsuit in 2016 against the White House and key federal agencies after incurring tens of thousands of dollars in unnecessary costs and years of delays in its public interest attempts to obtain U.S. government records about the Israeli nuclear weapons program under the Freedom of Information Act (FOIA). The lawsuit alleged that WNP-136, a 2012 "classification guide" forbidding federal agency release of any information about Israel's nuclear weapons program, was an unlawful legislative rule with a single purpose: to facilitate the unlawful delivery of the lion's share of the U.S. foreign aid budget to Israel, a nuclear weapons state, in violation of the Arms Export Control Act. Federal district and appeals courts refused to conduct in-camera review of of the two-page WNP-136—despite multiple requests to do so—before dismissing the lawsuit. Both claimed that the Plaintiff could not avail himself of the Administrative Procedures Act to challenge systemic undermining of FOIA for unlawful ends. On May 2, 2018 the court publicly announced its dismissal. Because WNP-136 was never reviewed by judges overseeing the case, on April 6, 2018 IRmep filed a separate lawsuit seeking review of the "Israel nuclear gag order" as it considers whether to seek review by the Supreme Court.